If you’re feeling under the weather or just want a natural immune booster that will effectively keep your entire body active and healthy, then the Myers’ Cocktail is a vitamin infusion that is packed full of amazing nutrients. This cocktail is named for John Meyers, M.D., a physician from John Hopkins Hospital in Maryland who began using intravenous injections of nutrients in the 1970s to help his patients with a lot of general health issues. The cocktail also became more popularized recently by Alan Gaby, M.D., who is one of the great doctors of nutritional medicine and has published many leading texts on the subject. The Myers’ Cocktail has a great history and legacy. It’s been around for 50 years and has been proven to help people suffering from a variety of ailments—including cancer, heart disease, chronic conditions like fatigue and pain from fibromyalgia, anxiety and stress, depression, headaches, leaky gut, weakened immune system, asthma and allergies. But the cocktail is not just for ailing patients. It’s for healthy patients who want to detoxify and keep their immune systems at optimal health, improve their metabolism, and increase energy throughout the day. What’s in the Myers’ Cocktail? The Myers’ Cocktail is basically like a super charged multivitamin in a bag.It’s a powerhouse mix of B-Complex Vitamins, B-12, Vitamin C, Calcium, and Magnesium—all infused into one liter of hydration. Getting this exact mix of vitamins is essential for overall health. As you can see, the benefits of the Myers’ Cocktail is a powerful combination of life-giving aids to a healthy body and immune system that you absolutely can’t live without in order to function at your optimum and/or heal properly. How Does the Myers’ Cocktail Work? The cocktail works by helping increase the intake of these vitamins through infusion into your blood, because taking intravenous vitamins is 50 times greater than what can be achieved through oral supplements. A lot of people have gut issues and digestive problems that can hinder their absorption of oral supplements, and so intravenous infusions help bypass that issue entirely by getting vitamins straight to your bloodstream. When taking the cocktail, a small catheter is inserted into a vein, and the infusion happens over about 20-30 minutes. There are usually no side effects, and most patients see results almost immediately to include more energy, deeper/fuller sleep, and decreased brain fog to name a few. If you’re interested in trying out a Myers’ Cocktail, then contact Elevation Hydration today! “Never again.” That’s what you tell yourself after a night of drinking and partying. No longer can you deal with the throbbing headache, nausea, indigestion, brain fog, and irritability. But then you go out with friends the next night. It’s as if you’re trapped in a never-ending hangover. So you go online and see which hangover cures really work. There’s a good chance you will find a bunch. In this blog post, we will go over some of the more common “cures” that don’t actually work. Chugging water - Elizabeth Narins of Cosmopolitan explains that alcohol inhibits a hormone that regulates water balance. So if you’ve wondered why you go to the restroom more frequently when you drink, this is why. As a result of all that water being sucked out of your cells, you may experience headaches, dizziness, dry mouth, and fatigue. The natural reaction is to want to chug water. However, the main cause of hangovers is a combination of congeners, acetaldehyde, prostaglandins, and the fact that alcohol throws off your sleep cycle. So no, don’t expect water to prevent you from waking up and feeling like you were hit by a truck. Consuming top-shelf liquor - It’s no secret that lower-quality wine and liquor often contain more impurities than pricier alcohol. Those ingredients can lead to hangovers. Still, don’t forget that all alcohol is toxic. Whether you’re drinking the cheap stuff or high-end stuff, you may not feel so hot the next morning. Eating a lot of carbs - Remember in college when you thought eating pizza after having one too many would prevent a hangover? Well, here’s the truth: Anything you eat before, during, and after drinking will reduce the rate at which alcohol hits the bloodstream. Therefore, the type of food doesn’t really have an impact. Just try to steer clear of foods that are particularly acidic, spicy, or salty. These foods may be tasty, but they can also trigger heartburn and indigestion. Drinking coffee - Many people struggle with symptoms of caffeine withdrawal the morning after drinking. Be aware, however, that coffee may worsen a throbbing headache since caffeine reduces swollen blood vessels while the alcohol simultaneously raises your blood pressure. That’s not exactly a great combination. Eating a greasy breakfast - What fun would a night of drinking be without a greasy breakfast the next day? Granted, nothing beats a burrito packed with cheese, potatoes, eggs, and bacon. But such a meal has indigestion written all over it. As an alternative, opt for fruit and toast instead. Taking over-the-counter pain medication - You have a brilliant idea. To eliminate any sort of hangover in the morning, you take a few OTC painkillers just before going to bed. It sounds great, right? The only thing is that most painkillers only last a few hours. So by the time you wake up, the effects have worn off. Not to mention, alcohol increases the secretion of gastric acids, which can wreak havoc on your stomach. Experts recommend waiting until morning to see how you feel. If you have a pounding headache, choose Alka-Seltzer instead. Staying in bed - Sometimes, the best medicine for a hangover is rest. But avoid sleeping the day away. Believe it or not, moving a bit can do wonders. Exercise releases endorphins, the body’s natural painkiller. On top of that, exercise increases circulation, which helps oxygen get to your cells and improves your mental outlook. Unfortunately, there is no magic potion for curing hangovers. With that being said, you don’t have to let those nagging hangover symptoms ruin another weekend. At Elevation Hydration, we offer several IV therapy hydration packages geared toward recovery. One of them is called “The Hang(Over).” For just $99, this IV vitamin therapy package includes a mix of B-Complex vitamins, Toradol for headaches, and Zofran for nausea. We infuse all of this into one liter of hydration. In no time, you will be back to feeling like yourself. See what IV fluids can do for your next hangover. Call Elevation Hydration to book your appointment. You just booked a trip to Colorado for the holidays. Whether you’re visiting loved ones or want some time to yourself, skiing and snowboarding are at the top of the list. But then you remember what happened last time you were in Colorado - a combination of headaches, nausea, and inability to sleep all but ruined the trip. This is what’s known as altitude sickness. In this article from The Denver Post, it’s said that 25 to 30 percent of visitors heading to the mountains get acute altitude sickness. So how do you avoid it and is there anything you can take that would help? Read on to learn more. We touched on altitude sickness in a previous post but it’s worth mentioning again. This condition can affect anyone regardless of age, gender, physical fitness, or previous experience with altitude. Longtime Colorado residents are susceptible to altitude sickness as well. So what’s the solution? Researchers recommend avoiding alcohol and salty foods. Don’t be afraid to drink a bit more water than normal. Doing so also helps visitors adjust to Colorado’s dry climate. If at all possible, take a day to acclimate at a lower election and rest before spending the rest of your time on the slopes. Let’s say that you will be flying in from Florida to Colorado. As soon as you land, the plan is to drive up to the mountains and enjoy some fun. This isn’t smart, though. The jump from sea level to elevation takes a serious toll on the body and requires some time for adjusting. The Altitude Research Center advises spending a day in Denver before increasing your elevation level even more. In fact, those who stay a night in the Mile High City reduce their chances of getting altitude sickness by anywhere from 25 to 50 percent. Those who can spend two nights in Denver may not experience symptoms at all. If you’re really concerned about altitude sickness, don’t be afraid to consult your doctor beforehand. They may choose to prescribe Diamox, which can reduce a person’s chances for altitude sickness by 80 to 90 percent. The Altitude Research Center also states that some studies suggest Gingko Biloba can help decrease symptoms. Unfortunately, there is no “one-size-fits-all” cure for altitude sickness. What works for you may not work for the rest of your family. That’s why it’s good to have a surefire backup plan. At Elevation Hydration, we specialize in IV therapy packages. We’ve found that IV vitamin therapy is one of the safest, quickest, and most effective ways to deliver vital nutrients to the body. Elevation Hydration is proud to offer a product geared specifically toward recovering from altitude sickness. ‘The Incline’ IV oxygen therapy package consists of a mix of B-complex vitamins (including B-12), as well as amino acids to help oxygenate muscles to fight fatigue. You can feel comfortable knowing this isn’t just a random concoction of IV fluids. We even include a can of Boost Oxygen so you’ll be enjoying the powder in no time! You want every competitive edge you can get as an athlete. Believe it or not, staying properly hydrated can be one of them. Remember that water regulates body temperatures and works to lubricate joints. Not to mention, water helps transport nutrients to give you energy and keep you performing at a high level. An athlete who isn’t hydrated may feel tired, have muscle cramps, dizziness, or other symptoms that negatively impact play. But how much water is enough during competition? Are sports drinks better than water in some cases? Where does heat stroke come into play? In this blog post, we will answer these questions. Two to three hours before exercising, drink 17 to 20 ounces. During your warm-up, drink eight ounces. In the middle of competition, drink about seven ounces of water every 20 minutes. No more than 30 minutes after the conclusion of your exercise, drink another eight ounces of water. The majority of people stay properly hydrated with water alone. In some cases, though, the occasional sports drink may be helpful. 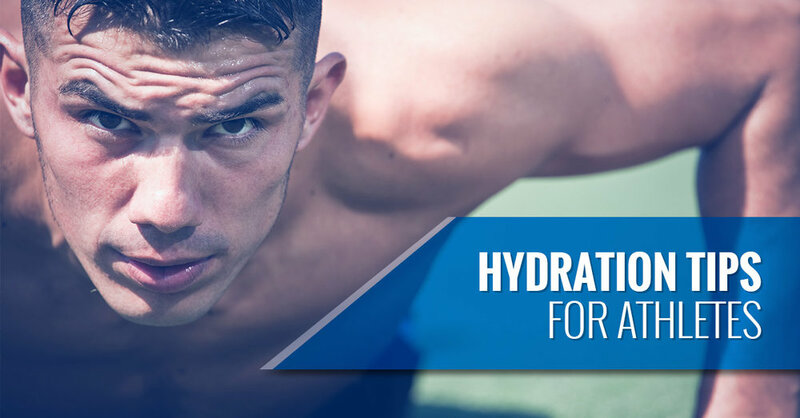 In addition to their hydrating qualities, sports drinks provide additional energy and electrolytes to allow you to perform longer. It sounds great, right? The only problem with sports drinks is the sugar content. Plus, they’re usually high in calories and contain high levels of sodium. If you feel like you absolutely must have that sports drink, consider alternating it with water. There’s just nothing that compares to pure water. Heat cramps - Watch for painful muscle spasms in the legs, stomach, arms, or back. Heat exhaustion - This involves more serious symptoms such as faint or weak feelings, fast heartbeat, nausea, headache, and low blood pressure. Heatstroke - The most serious of the three, heatstroke involves abnormally high body temperature, fast heartbeat, flushed skin, fast breathing, delirium, loss of consciousness, and even seizures. If you or a loved one is experiencing any of these, seek medical attention immediately. At Elevation Hydration, we use only the purest forms of essential vitamins and nutrients. Since they’re delivered intravenously, you’re getting 100 percent of the vitamins your body craves. You might be thinking, “IV fluids sound great, but I just don’t have the time or money for it.” That’s not the case at all! Our IV vitamin therapy is convenient and affordable for everyone. Just walk into our office and fill out a brief medical questionnaire. An IV oxygen therapy then works with you in selecting the ideal hydration package. Customers are in and out in less than an hour. Rest assured that there’s no co-pays with any of our treatments! Don’t go another day without being properly hydrated. Schedule an appointment now. Nobody has time to get sick. But it always seems like we catch some sort of bug at the absolute worst time. We’re forced to miss school, work, and fun activities with loved ones. Granted, there’s no surefire cure for the common cold. However, there are steps you can take to boost your immune system and fend off the next sickness that goes around. Keep reading to learn our five tips for never getting sick. Get a flu shot - WebMD confirms that nearly 20 percent of the U.S. population contracts the flu virus each year. Taking it a step further, nearly 200,000 Americans are hospitalized with the illness annually. With flu season just around the corner, be proactive and make sure you get a flu shot. The vaccine is offered at local drugstores and grocery stores for your convenience. There’s even a good chance your employer will be offering them for free. Spend time outside - There’s nothing like enjoying Mother Nature this time of year in Colorado. Getting outside does two things for your body. For one, escaping into the fresh air gives you a break from all the germs inside. Secondly, exercising outside can actually boost your immunity. So while you may enjoy staying warm and cozy indoors, be sure to set aside some time for the outdoors. Make time to relax - Experts continue to emphasize the importance of relaxing. Why? Well, being stressed increases the chances of catching a cold due to the ongoing release of hormones such as glucocorticoids. These stress hormones limit the body’s ability to produce cytokines, a disease-fighting response from the immune system. If you feel as though you’re overwhelmed, take a step back and remember to take care of yourself. Wash those hands - It’s conventional wisdom, and yet, a lot of folks fail to do it as often as they should. According to the Centers for Disease Control and Prevention, soap and water remain most effective in efforts toward not catching a cold. Pro tip: Use a hands-free dispenser and opt for regular soap instead of antibacterial. Lather for about 20 seconds before rinsing and be sure to dry thoroughly, as damp hands are more likely to spread bacteria. Catch plenty of zzz’s - This article from Health.com cites an interesting study from 2009 regarding sleep. It found that anything less than seven hours of sleep nearly triples your odds of catching a cold. Keep in mind that this means seven straight hours, not accounting for restlessness in the middle of the night. Today, we are rarely presented all options when it comes to getting and staying healthy. The human body has an amazing amount of innate intelligence in order to fend off disease and shield itself from toxins. There are times when medications simply don’t do the trick. That’s why we have to take it upon ourselves and boost our immune functions naturally. Doing so encourages the body to do what it does best and that’s heal and stay healthy. This is where IV therapy comes into the equation. With how busy our schedules are, it can be a challenge trying to stay healthy. Elevation Hydration in Colorado Springs is changing the way we approach the common cold. Our IV vitamin therapy experts use only the purest forms of vitamins and nutrients for our hydration packages. Since they’re delivered intravenously, you’re getting 100 percent of the vitamins that are essential for wellness. Don’t forget that with proper hydration, the body remains healthy, repairs and rebuilds, and keeps invading organisms at bay. Looking to boost your immunity or kick that cold in a hurry? Then this package has your name all over it! This IV oxygen therapy package includes vitamins C and D3, zinc, and glutathione. Think of the Myers’ Cocktail as a powerhouse multivitamin in a bag. It’s packed with B-complex vitamins, B-12, vitamin C, calcium, and magnesium. At Elevation Hydration, we can get you back on the road to recovery. With 45-minute sessions available, it’s no secret why so many folks in Colorado are seeing what we’re all about. Frequent fliers often spar with the symptoms of jet lag. Whether it’s disturbed sleep, daytime fatigue, difficulty concentrating and functioning, or stomach problems, jet lag can cause a number of challenges. That said, by implementing some new strategies, you can lessen the nasty effects of jet lag. Keep reading for 10 ways to effectively cope with jet lag, as explained by WebMD. Start your schedule before you leave - By adjusting your schedule in advance of your flight, you allow your body to get a head-start. For example, if you’re traveling east, shift your bedtime 30 minutes earlier each for several nights. Do the opposite if you’re traveling west. Adapt to your new schedule during the flight - For psychological reasons, it’s a good idea to change the time on your watch once you get on the plane. This practice helps you get into the mindset of your itinerary for when you arrive at your destination. Arrive early - This is a must for folks who travel for business. Do what you can to arrive a few days early so your mind and body can get acclimated. Should this not be an option, try to get some sleep on the flight if you can. Stay hydrated - We’ll expand on this later, but it’s imperative to drink water before, during, and after your flight so dehydration doesn’t set in. Several hours before you plan to sleep, steer clear of alcohol or caffeine. Keep moving - Depending on the flight’s duration, get up and walk around periodically. Even while sitting, try doing some static exercises and stretching. Pro tip: though you may want to hit the gym before bedtime, avoid doing so, as it can delay sleep. Consider natural light therapy - Keep in mind that exposure to sunlight helps regulate our circadian rhythms. On westward flights, get bright morning light at your destination and avoid afternoon/evening light exposure. Do the opposite for eastward flights. Natural light therapy helps shift the body’s circadian clock so that you feel rested and wake at ideal times at your destination. Eat smartly - Contrary to popular belief, no research has confirmed the benefits of eating a heavy diet prior to traveling and then fasting the day of the flight. To keep your sleep patterns in check, avoid eating a high carb or fatty diet close to bedtime. Take a hot bath - After a long, stressful day of travel, your body could use a bit of pampering. A hot bath relaxes sore muscles and allows you to wind down. As an added benefit, the drop in body temperature when you get out of a bath may make you sleepy. Eliminate sleep distractions - Do you find yourself struggling to sleep on your flights or even in your room at night? Try to minimize distractions such as light shining in through a window. Invest in high-quality earplugs or an eye mask if need be. Consult your doctor - If you don’t find success with any of the aforementioned tips, see if your doctor can be of any help. They may be able to prescribe medications to take temporarily that help you sleep or stay alert on your next trip. Elevation Hydration offers hydration packages that work great for jet lag. IV vitamin therapy promotes overall wellness and recovery through essential vitamins and nutrients. Take your pick from the following IV oxygen therapy options: Elevate (recovery), Immune Tune (immunity), and Myers’ Cocktail (immunity). Call Elevation Hydration for proven, affordable jet lag treatment. After a night of partying, you wake up feeling as if you were hit by a train. But you don’t have time to just lay around all day in the hope that your hangover will go away on its own. In the past, you went online and found some crazy concoction that guaranteed to eliminate your hangover. Unfortunately, it only made you feel worse. Keep reading to check out which hangover cures actually live up the hype. Make a Virgin Mary - Many folks believe that a Bloody Mary is the beverage of choice when it comes to ditching that hangover. However, the worst thing you can do is have another drink. 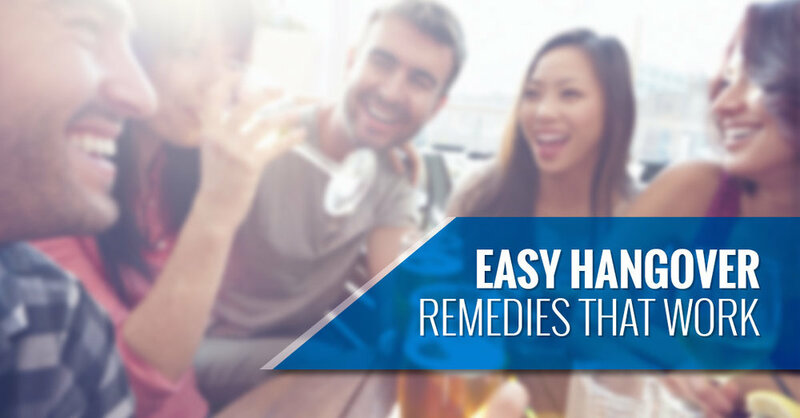 Keep in mind that those nasty hangover symptoms stem from the toxins in alcohol. So stick to tomato juice and give your body a chance to recover. Eat light - Maybe you already know the importance of getting food back into your system following a night of drinking. While a greasy breakfast sounds appetizing, it’s probably not the best choice. Skip the pile of bacon and opt for easy-to-digest foods such as toast or cereal. Take some Alka-Seltzer - This one’s a bit tricky. Alka-Seltzer can settle symptoms of queasiness by neutralizing stomach acid. On the other hand, ingredients such as aspirin and citric acid may irritate your stomach. If you choose Alka-Seltzer, tread lightly. Drink a small amount of coffee - If you’re under the impression that multiple cups of coffee can be the solution to your hangover, think again. Caffeine narrows your blood vessels and raises blood pressure, worsening your symptoms. Should you absolutely need that morning cup of joe, go with a very small amount and wait about an hour until drinking more. Take a multivitamin - There’s next to no evidence surrounding the effectiveness of hangover pills. Rather than pay the hefty cost of these, take a multivitamin instead. It will restore the nutrients in your body that you may have lost the night before. Consume water and sports drinks - Neither provide a cure, however, water and sports drinks replace the fluid you’ve lost. Whether you choose water, juice, gatorade, or a combination of the three, chances are that you’ll feel less miserable. Take pain relievers - Anti-inflammatory pain relievers can provide some relief. Just be sure to take the advised dosage and avoid taking with alcohol. Exercise - This seems crazy, right? Your head is pounding, you feel nauseous, and you’re sensitive to light. Believe it or not, though, a gentle workout could help you feel better. By gentle, we mean light stretching, yoga, or a walk. The last thing you should do is attempt some sort of high-intensity workout. Cold shower - Are you in need of an immediate energy boost despite having hangover symptoms? A brief cold shower should do the trick. Whatever you do, steer clear of “sweating out” the alcohol at a sauna. This can cause potentially dangerous blood vessel and blood flow changes in the body. It’s even been proven that sauna bathing while hungover carries significant health risks such as drops in blood pressure and abnormal heart rhythms. Sleep - If you’re to sleep off the symptoms the next day, take the opportunity. Sometimes it’s best to just rest and let your body work its healing magic. Are you looking for a proven hangover cure that’s different from traditional methods? IV therapy from Elevation Hydration may be for you. IV oxygen therapy is one of the safest, quickest, and most effective ways to deliver vital nutrients to the body. At Elevation Hydration, we use only the purest forms of essential vitamins and nutrients for our hydration packages. Our innovative method allows these nutrients to bypass the stomach, meaning they’re available for immediate use. Our IV vitamin therapy team understands that hangovers are no fun. It’s why we created The Hang(over) hydration package. This hangover treatment consists of IV fluids that are intended to bring you back from the dead after a night of drinking! Take advantage of a mix of B-Complex vitamins, Toradol for headaches, and Zofran for nausea. For less than $100, you get all of this infused into one liter of hydration. Don’t let your next hangover ruin an entire weekend. Instead, schedule your IV therapy session with Elevation Hydration. Whether you’re a current patient or just came across our website for the first time, we want to welcome you to Elevation Hydration! We are proud to be the only hydration therapy clinic in Colorado Springs and the southern front range. What exactly is a hydration therapy clinic, you may ask? We will answer that, explain more about who we are, and get into some of the hydration packages that we offer. We don’t give our bodies enough credit. On a daily basis, we expect them to fight off disease and protect against toxins. Meanwhile, we’re juggling hectic work schedules, social calendars, and family life. The reality is that these deadlines can lead to a combination of poor nutritional choices and little exercise. However, our bodies continue to power through as much as possible. Over time, our bad habits turn into lifestyles. It’s not surprising that 50 percent of people taking multivitamins are still nutritionally deficient. Why? In our fast food-driven society, we fail to consume the necessary foods that enable us to perform at optimum capacity. Down the road, these micronutrient deficiencies can result in poor memory, loss of sleep, fatigue, decreased immune function, and other setbacks. We founded our IV therapy facility because we have a passion getting Coloradans back to their active lifestyle. Our team doesn’t believe in simply masking health issues with short-term solutions such as potentially dangerous over-the-counter medications. Instead, we make it a point to boost our immune functions naturally to let the body do what it does best and that’s heal and stay healthy. Keep in mind that this is one of the safest, quickest, and most effective ways to deliver vital nutrients to our bodies. The IV vitamin therapy options that we provide make the perfect treatment for altitude sickness, migraine treatment, hangover treatment, or jet lag treatment. It’s no secret that Colorado Springs is a hotbed for elite athletes and Olympians in particular. That’s why we carry several hydration treatment packages for athletic recovery. You can feel comfortable knowing that Elevation Hydration uses only the purest forms of essential vitamins and nutrients for all of our packages. With IV oxygen therapy, the nutrients bypass the stomach and are not affected by intestinal absorption, making them available for immediate use. What does this mean for you? You’re getting 100 percent of the vitamins your body craves and nothing else! By staying properly hydrated, the body instinctively remains healthy, repairs, rebuilds, and fends off invading organisms. Ready to get started? You’ll first come to our office and fill out a brief medical questionnaire. We then sit down with you to understand your needs and select the most appropriate hydration package. Sessions typically last no longer than 45 minutes and there’s no downtime involved once you’re done! Best of all, you don’t have to concern yourself with co-pays or long waits. When you come to us, our mission instantly becomes getting you back to your active lifestyle as quickly as possible. We also offer several add-ons, such as zinc, Vitamin D3, and additional hydration. If you believe it’s time for a boost, call us today to book your appointment.